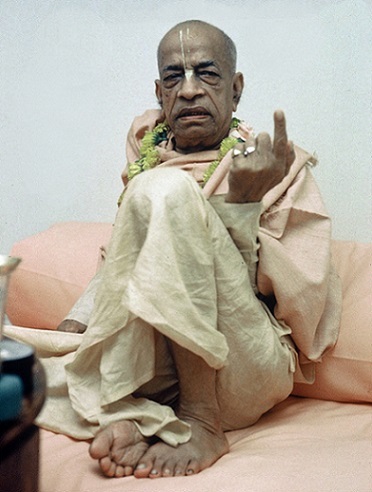 Prabhupāda: So people are so degraded, and there is no education, and there are so-called leaders, they are themselves degraded, they are themselves blind. So what is the position of the present society? It is very precarious condition. Therefore, at the end of Kali-yuga, people will be more and more, more and more degraded. There will be no more preaching. Kṛṣṇa will come as Kalki avatāra, simply killing, simply killing. That's all. Finished. Prof. Regamay: But they have still 4,000 years of Kali-yuga. Prabhupāda: Not 4,000; 400,000. So yes the time is coming. And now the partial killing is going on. You drop this... The atom bomb is ready. You have got; I have got. I drop on you, and you drop on me. Both of us, we finished. This is going to be happening. People are so degraded. So unless one takes to Kṛṣṇa consciousness, there is no possibility of being saved. There is example, that grinding mill... You know, grinding mill? Prabhupāda: Yes, and the grains are put within it, and they are all smashed. But one grain who takes shelter of the center, the pivot, it is not smashed. Similarly, the modern civilization is such that everyone will be smashed. And one takes the central point shelter, Kṛṣṇa consciousness, he will not be. Kaunteya pratijānīhi na me bhaktaḥ praṇaśyati (BG 9.31). So best thing is to take shelter of Kṛṣṇa and save yourself.